Secret Song Designs: Bead Soup Reveal! As a reminder, the way this works is that I received a package of beads from my partner, Krafty Max that included among other things a beautiful red flower focal bead and a floral clasp that I needed to incorporate into my creation. The flower clasp was far too beautiful to place in the back of the necklace though! I tried this out a couple of ways, first with the smaller silver flower from the clasp as the top piece leading to the larger flower that would sit lower on the body, but ultimately I decided on really putting the focus on that beautiful reddish orange flower. If you read about my inspiration, you'll see why I chose to add the turquoise color palette that I did. I happened to also have some really interesting mixed beads that actually incorporated that red color along with a couple of shades of turquoise. I hadn't made anything with these yet, so this seemed like the perfect project to add them in. And remember, there are three reveals this time around, so this list is only the first group. I can't believe how many people are participating in all three reveals. Please visit these other amazing artists! Bold design...perfect for spring and summer! I think the multi-strand necklace sets off the design perfectly! I love it! Gorgeous layout and beautiful finished piece! What a great statement piece this is - beautiful! Lovely design on your soup necklace, that bright flower focal just lights up with spring, very pretty! WOW. I think this many strands would have made me crazier than I am ! Awesome necklace--love the statement it represents. So versatile, it could even be worn dramatically with jeans and t-shirt to dress it up! What a beautiful statement piece! Well done! Like the multi-strands and the two flowers in the front. Nice solution to the challenge. Those look like rainbow calsilica -- are they? This is a STUNNING piece, truly gorgeous!!!! Lovely necklace. I love the way you used the focal flower. Lovely statement piece. Perfect for Spring/Summer! What a lovely colorful necklace. I really like the beads going across the focal, that is a great eye catcher. Good work! I love how you captured the focal, gorgeous necklace. That's an innovative use of the focal! Beautiful! I really like how you used the focal flower! I never sure how to work those flowers into a piece. amazing focal! And a nice way of showing off the clasp in a different way too. Oh, just beautiful as a necklace - loving the colors. The neckline shows a lot of detailed workmanship. That is one heck of a statement piece! Very nicely done. I love how you embellished the focal! Unique and lovely creation! What a statement piece its bold and strong. Absolutely beautiful! Love the way you highlighted the focal, it is stunning. Love your necklace! Beautiful use of the red flower. Very eye-catching! Love the design, it's beautiful. Wow - so much beautiful work! Wow, what a beautiful necklace! You've designed a gorgeous necklace and so unique. Nice idea with the mounting of the red flower - you did a great job! Pretty focal. Thanks for sharing! You nailed it with your inspiration piece. The colors are spot on! Very cool design! Thank you for sharing your beautiful talent! Great focal and lovely design. That necklace is screaming spring and summer.. I love love love it. 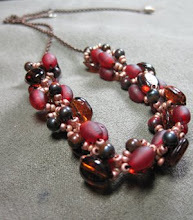 I love the feel of the necklace and the colors and the movement and... I really love the necklace! Have a Blessed Day!!! Nice colors - and a really creative way to connect the focal to the multi-strands. Good job! Stunning! My compliments to the chef! A stunning necklace with great colors! What a great summer design...very bold and great color. Fantastic job! You did an outstanding job with this. I love the multiple strands and the way you strung the flower focal and the LONG length! What an awesome statement necklace you created!